The geoSYSTEM surfaces have garnered high praise in relation to their usage, however there are instances where achieving the intended effect does not always come without complications. Unevenness, cracks, bulges – these are not the effects of a faulty product, but its improper installation. What can lead to these types of issues? How to prevent errors in the practice of laying the geoSYSTEM grids? You should take the first preventive steps at the very beginning, by properly adapting the height of the substructure to the purpose of the surface and frequency of traffic. A correctly prepared substructure will guarantee stability and, what is most important, durability. If the surface is intended for pedestrian traffic, a sufficient substructure height is 10 cm, however in the case of passenger cars – 30 cm. It is necessary to consider heavy traffic separately, as it requires the preparation of the surface with a 50 cm substructure. On soil with lower permeability, such as clay, it is necessary to ensure a deeper substructure – approximately 20 cm. 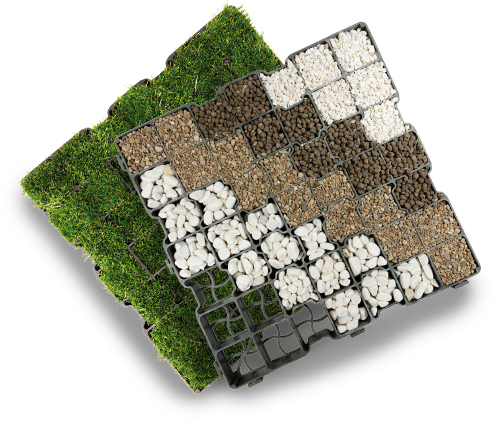 The eco grid is made of fully recyclable plastic, therefore it is necessary to remember that at higher temperatures they can expand and shrink at lower temperatures. This, unfortunately, is an aspect often not considered when laying and joining the grids. To avoid unappealing bulges or cracking surfaces it is necessary to remember proper dilatation. Always use a 5 cm gap between the grid and another surface, curb or object fitted to the surface. This will allow you to avoid disturbing the natural surface shifting during atmospheric condition changes. The final stage of installation if filling the eco grid. There are many variants to choose from and each of them requires following one rule: even filling of the geoSYSTEM grids. Remember that the walls should always be completely covered with stone or overgrown with grass. The risk of mechanical damage increases, if you leave the grid walls even partially uncovered. Always remember this also during use. It is worth adding, that it will also have positive impact on the aesthetic of your surfaces. Follow the above guidelines, and together we will prevent any complications with the geoSYSTEM grid. Always remember of the distinct properties of your surface and its purpose. Thanks to proper installation, you will be able to enjoy a durable and fully functional ecological surface for many years to come.